You all know I have been crazy for Rainbow quilts the last while. 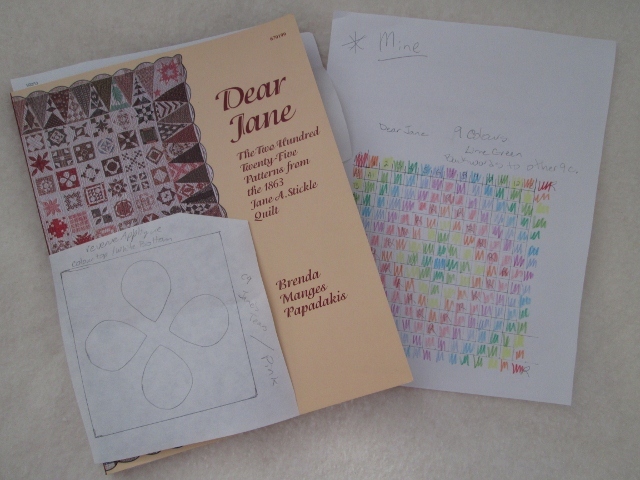 I have decided to do a Dear Jane Rainbow quilt. Angela over at Soscrappy has started a rainbow Dear Jane and I am going to join her. My rainbow is a little different then hers. 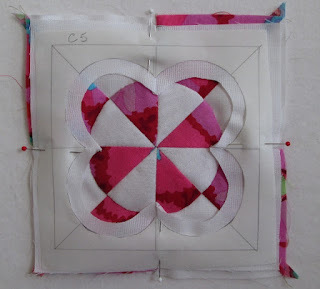 I also found a blog with some tutorials for each block over at That Quilt. I have owned the book for years and knew I would never make it in the older reproduction fabrics. Doing it in rainbow bright colours will be so much funner. Here is a start to a first block. I am starting with Pink, as Pink is the colour for January Rainbow Scrap Challenge. As we have just a few days left I will not get all the pink done. I may not follow the colours each month very well but we will see. Now to get this block stitched. It will be great to watch your progress! I love the idea of the using the rainbow colours but I have already started mine with stash fabrics. Who knows...there could always be a second one in the future. Woohoo for for you! Great layout. I have really enjoyed that quilt too. Even if I don't exactly follow her method each time, it is great to see the whole process in pictures. Your first block is awesome! Beautiful! Good luck with your DJ. It will be fun to watch you both working on this one. Okay...You're a braver woman than I, that's for certain! Looking forward to seeing your process...and progress.